Bushehr Province has an area of ​​22743 square kilometers and is the 19th province of Iran in terms of size. It is located along the eastern shores of the Persian Gulf and neighbors the provinces of Khuzestan, Kohgiluyeh and Boyer-Ahmad, Fars and Hormozgan. The population of this province is about 1.5% of the country’s total population and has 10 counties. 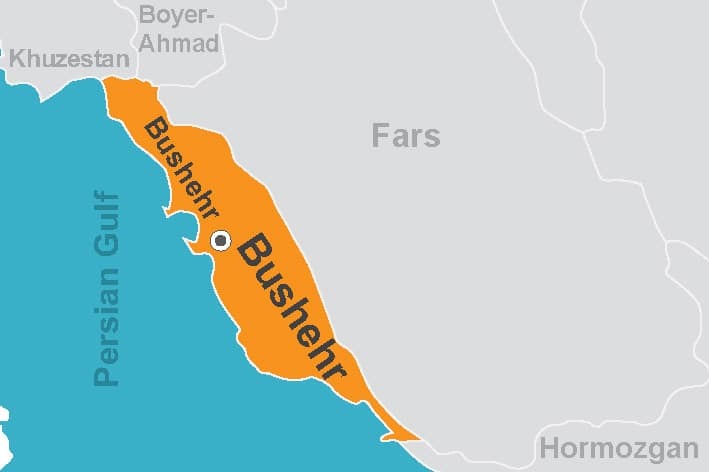 The center of the province is called Bushehr. Its natural structure is composed of plains and low-altitude coastal lands. Its climate is warm and humid in the coastal areas and warm and dry in internal areas. The autumn and spring of Bushehr are very short-lived, it has a relatively cool winter and a warm, dry and long summer. Most people in the province are Fars, and the common language is Persian with Bushehr dialect. Nevertheless, the economic and industrial situation of the region, the presence of the nuclear power plant and shipbuilding industry have attracted immigrants to Bushehr province. The oldest signs of settling in Bushehr province date back to the era of Elam civilization. The discovery of tablets made of baked mud written in Elamite in the Sabzabad Rishahr hill is a testimony to the importance of Persian Gulf coast during that time. The ancient city of Liyan near the present Bushehr was the connecting bridge with the Indian Ocean and southeast of Asia. There are palaces and temples remained from Achaemenid period in different parts of Persian Gulf, Bushehr and Borazjan including the Winter Palace of Bardak Siah. Siraf harbor is another important and historical area of ​​Bushehr province which is located near current Taheri port. In the 4th century AD, Siraf had great commercial importance and was considered as one of the largest cities of Abbasids period. Bushehr played a significant role during the Constitutional Revolution and its constitutionalists, in line with other parts of Iran, opposed Mohammad Ali Shah. After the invasion of British colonial forces, Tangestani troops which was led by Rais Ali Delvari rebelled against them. Persian Gulf is one of the most important attractions in the province with its beautiful beaches, the salt dome of Jashak, Siraf, Rishahr, Palace of Bardak Siah, texture of the city and Saadat School. The school is historically a part of the Qajar period and is the oldest surviving school in southern Iran. 18th of March, the anniversary of its foundation, is considered as Bushehr Day. The most important handicrafts of the province include carpet, decorative objects with shellfish, handmade fish catching net and shipbuilding. Among Bushehr souvenirs, we can find different kinds of Persian Gulf fish, shrimp, dates, tahini and halva. Residents of non-coastal areas use more wheat and dairy products as their main food ingredients and those who reside in coastal areas use more offshore products. Ghalieh Mahi and meygoo(fish and shrimp stew), Tandaz Mahi (fish broth), Abgoosht mahi (fish dish) and lekhlakh are the native foods of the region. Among the prominent figures of the province are the Ali Delvari (oppositional leader), Sadeq Chubak (writer and literary critique) and Najaf Darya Bandari. Darya Bandari is a pioneer author and translator whose name was registered as “The Living Treasure of the National Gastronomy” in the summer of 2017.